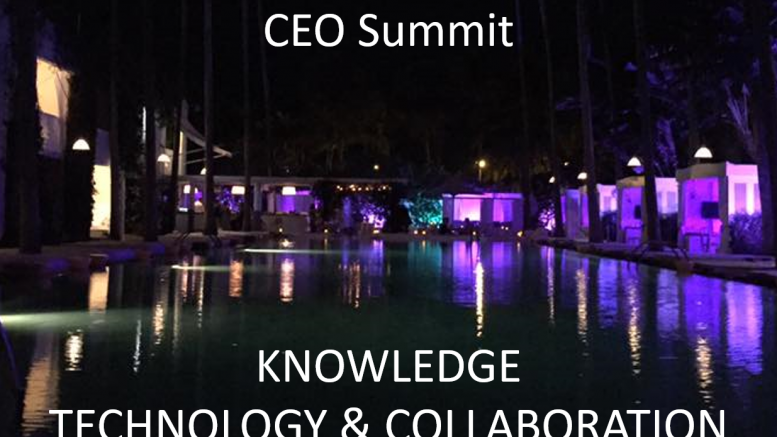 Writing this at the Miami Airport as I’ve just finished up a great 3 day meeting of the minds at the new Insights Association’s first official event, the Marketing Research CEO Summit. Though this event was formerly part of the Marketing Research Association (MRA), after the merger between The MRA and the Council for American Survey Research Organizations (CASRO), it is now is part of the greater and brand new Insights Association. This is also the reason I chose to attend the event for the first time this year. I like many others are eager for positive change in our industry and optimistically welcome new initiatives (as I mentioned in a post on their founding earlier this month). Steve Schlesinger, CEO of Schlesinger Associates and Merrill Dubrow of M/A/R/C Research did a great job putting together and hosting the event. While the obvious benefit of any event like this is the attendees and not the speakers, we had some other interesting and well respected client guests including Walmart’s Urvi Bhandari, Merck’s Lisa Courtade, Electrolux’s Brett Townsend and Dhan Kashyap from Humana. Their very candid evaluations of how well the industry is delivering *Hint* it’s not even close to as well as we think, was worth the cost of attendance. Getting back to the attendees though, Market researchers as a breed are a cautious bunch and CEO’s in any industry are likely going to be “Alpha’s”. Quickly gaining trust and enabling sharing among this audience of would be competitors is not an easy task. Partly this was made possible via a fun case study competition sponsored by La Quinta CEO Keith Cline who also spoke at the event. Another interesting aspect of the event was the Hot Seat interviews wherein a handful of the CEO’s in attendance were asked a series of tough and sometimes semi personal questions. I was one of those selected for this impromptu exercise and was asked what I thought about various aspects of the future of marketing research including digital/social (which I like to separate from other text analytics), and of course the topic of machine learning/AI which seems to be on everyone’s mind. For that reason I’ve decided to do a short blog post on AI and Machine learning later this week. I admit it’s a tricky question, and obviously if I didn’t consider myself at least in part a marketing research CEO I wouldn’t have attended. Yet many of our software users definitely aren’t market researchers. So here goes, I think we as an industry have an important skill set and understanding of our clients that no outsider has. I’m proud of this background and like other speakers including ZappiStore’s CRO Ryan Barry and Dan Foreman of Hatted pointed out, the future is not in resisting technology, nor is it necessarily in building your own technology, which can be time consuming and wasteful, but it’s about embracing technology and often learning how to rent or partner with technology experts and adding what you are best at (often data and as importantly consultative insights and strategy). Several of the CEO’s I spoke with separately admitted having tried various internal technology builds which either weren’t right, or in some cases may have been right when the effort began, but didn’t evolve quickly enough and so was outdated when they did come to market. Yet it was also quite clear to most of these CEO’s that while it’s critical to watch out for new technology oriented entrants into the market research space, more often than not these simply do not have the knowledge necessary to deliver truly actionable insights. Companies like IBM Watson for instance, certainly have a strong brand name in computers, but their offering as a plug in for marketing research API’s is sorely lacking to say the least. The point is, knowledge and trust is what we have in good supply at both the event and in our industry in overall. The key to evolving is to remember the knowledge and best practices our industry was based on while being open to understanding outside technologies and ideas, yet resisting the urge to just try to copy them. Importantly as Merrill Dubrow pointed out, there are tremendous benefits in overcoming your fear of collaborating with other research and technology companies and partnering. This is the idea I’m most optimistic about coming away from the conference. I made several new friends at the event, and I welcome anyone who attended to please reach out if they have are any questions in regard to text analytics and data mining software and discussing potential mutually beneficial relationships. OdinText is a patented SaaS (software-as-a-service) platform for advanced analytics. Fortune 500 companies such as Disney and Shell Oil use OdinText to mine insights from complex, unstructured text data. The technology is available through the venture-backed Stamford, CT firm of the same name founded by Tom H. C. Anderson, a recognized authority and pioneer in the field of text analytics with more than two decades of experience in market research. Anderson and OdinText have received numerous awards for innovation from industry associations such as ESOMAR, CASRO, the ARF and the American Marketing Association. He tweets under the handle @tomhcanderson. Request OdinText Info or a free demo here. Be the first to comment on "Insights Association’s 65 CEOs Share Thoughts on Marketing Research Industry"